Psychedelic folk (sometimes acid folk or freak folk) is a loosely defined form of psychedelia that originated in the 1960s. It retains the largely acoustic instrumentation of folk, but adds musical elements common to psychedelic music. The first musical use of the term psychedelic is thought to have been by the New York-based folk group The Holy Modal Rounders on their version of Lead Belly's 'Hesitation Blues' in 1964. Folk/avant-garde guitarist John Fahey recorded several songs in the early 1960s that experimented with unusual recording techniques, including backward tapes, and novel instrumental accompaniment. His nineteen-minute "The Great San Bernardino Birthday Party" "anticipated elements of psychedelia with its nervy improvisations and odd guitar tunings". Other songs from Fahey's The Great San Bernardino Birthday Party & Other Excursions (recorded between 1962 and 1966) also used "unsettling moods and dissonances" that took them beyond the typical folk fare. In 1967, he performed with the psychedelic/avant-garde/noise rock band Red Krayola (then Red Crayola) at the Berkeley Folk Festival which was recorded and later released as Live 1967. Among other descriptions, their performance has been likened to "the very weirdest parts of late-'60s Pink Floyd pieces (like the shrieking guitar scrapes of 'Interstellar Overdrive')". Similarly, folk guitarist Sandy Bull's early work "incorporated elements of folk, jazz, and Indian and Arabic-influenced dronish modes". His 1963 album Fantasias for Guitar and Banjo explores various styles and instrumentation and "could also be accurately described as one of the very first psychedelic records". Later albums, such as 1968's E Pluribus Unum and his live album Still Valentine's Day 1969, which use experimental recording techniques and extended improvisation, also have psychedelic elements. Musicians with several groups that became identified with psychedelic rock began as folk musicians, such as those with the Grateful Dead, Jefferson Airplane, Country Joe and the Fish, and Quicksilver Messenger Service from San Francisco; the Byrds, Love, Kaleidoscope, and Peanut Butter Conspiracy from Los Angeles; Pearls Before Swine from Florida; and Jake and the Family Jewels, and Cat Mother & the All Night Newsboys from New York. 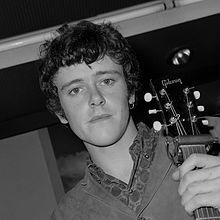 In the UK, folk artists who were particularly significant included Marc Bolan, with his hippy duo Tyrannosaurus Rex, who used unusual instrumentation and tape effects, typified by the album Unicorn (1969), and Scottish performers such as Donovan, who combined influences of American artists like Bob Dylan with references to flower power, and the Incredible String Band, who from 1967 incorporated a range of influences into their acoustic based music, including medieval and eastern instruments. During the late 1960s and early 1970s, solo acts such as Syd Barrett and Nick Drake began to incorporate psychedelic influences into folk music with albums such as Barrett's The Madcap Laughs and Drake's Five Leaves Left. In the mid 1970s psychedelia began to fall out of fashion and those folk groups that had not already moved into different areas had largely disbanded. In Britain folk groups also tended to electrify as did acoustic duo Tyrannosaurus Rex which became the electric combo T. Rex. This was a continuation of a process by which progressive folk had considerable impact on mainstream rock. Interest in folk music among the independent artists and crossover bands that dominated much of the underground music scene in the late 1990s led to a revival of psychedelic folk during the following decade, with the New Weird America movement, which also saw the rise of the stylistically similar genre of freak folk. Also, Animal Collective's early albums identify closely with freak folk as does their collaboration with veteran British folk artist Vashti Bunyan, and The Microphones/Mount Eerie, who combine naturalistic elements with lo-fi and psychedelia. Both artists received significant exposure in the indie music scene following critical acclaim from review site Pitchfork Media and soon more artists began experimenting with the genre, including Quilt, Grizzly Bear, Devendra Banhart, Rodrigo Amarante, and Grouper. Freak folk is a loosely defined synonym or subgenre of psychedelic folk which involves acoustic sounds, pastoral and delightful lyrics, and a neo-hippie aesthetic. The label originated from the "lost treasure" reissue culture of the late 1990s. Vashti Bunyan has been labelled "the Godmother of Freak Folk" for her role in inspiring the new crop of folk experimentalists. Other major influences on later freak folk artists include Linda Perhacs, Anne Briggs, Shirley & Dolly Collins, the Incredible String Band, and Pearls Before Swine. Devendra Banhart would become one of the leaders of the 2000s freak folk movement, along with Joanna Newsom. ^ Zeger, Eli (January 13, 2013). "Panda Bear Releases New Album: The Evolution of Noah Lennox in 10 Songs". The Observer. ^ Unterberger, Richie. "Rough Trade Shops - Psych Folk 2010". AllMusic. ^ Van Waes, Gerald. "A Brief Overview of Psych-Folk and Acid Folk, from 60s until now". Retrieved July 1, 2009. ^ Hicks (2000), pp 59–60. ^ a b Unterberger, Richie. "The Great San Bernardino Birthday Party & Other Excursions — Album Review". Allmusic. Rovi Corp. Retrieved July 25, 2013. ^ Unterberger, Richie. "The Red Crayola Live 1967 — Album Review". Allmusic. Rovi Corp. Retrieved July 26, 2013. ^ Unterberger, Richie. "Sandy Bull — Biography". Allmusic. Rovi Corp. Retrieved July 16, 2013. ^ Greenwald, Matthew. "Fantasias for Guitar & Banjo — Album Review". Allmusic. Rovi Corp. Retrieved July 16, 2013. ^ Eder, Bruce. "E Pluribus Unum — Album Review". Allmusic. Rovi Corp. Retrieved July 26, 2013. ^ Westergaard, Sean. "Still Valentine's Day 1969 — Album Review". Allmusic. Rovi Corp. Retrieved July 26, 2013. ^ Auslander (2006), pp. 76. ^ Unterberger (2002), pp. 183–230. ^ DeRogatis (2003), p. 120. ^ "Five Leaves Left review". Allmusic. Retrieved June 7, 2011. ^ Sweers (2005), pp. 40. ^ Macan (1997), pp. 134–5. ^ "Splendid Magazine reviews Animal Collective (featuring Vashti Bunyan): Prospect Hummer". Splended. September 13, 2005. Archived from the original on July 9, 2009. Retrieved June 30, 2009. ^ "Splendid E-zine reviews: The Microphones". Splendid. Archived from the original on January 18, 2008. Retrieved June 30, 2009. ^ "Animal Collective: Sung Tongs". Pitchfork Media. May 2, 2004. Retrieved June 30, 2009. ^ "Animal Collective / Vashti Bunyan: Prospect Hummer EP". Pitchfork Media. May 15, 2005. Retrieved June 30, 2009. ^ "The Microphones: The Glow, Pt. 2". Pitchfork Media. September 10, 2001. Retrieved June 30, 2009. ^ "Grizzly Bear Feeds on Psych-Folk". The Harvard Crimson. February 11, 2005. Retrieved June 30, 2009. ^ "Grouper – Dragging A Dead Deer Up A Hill review". Mojo. December 2008. Retrieved June 30, 2009. ^ a b c d e Carew, Anthony. "Genre Profile - Freak-Folk". About.com. ^ a b Rogers, Jude (January 2, 2008). "Lie back and think of ukuleles". The Guardian. Retrieved August 1, 2008. ^ Jurek, Tom. "Linda Perhacs". AllMusic. ^ MacNeil, Jason. "Devendra Banhart". AllMusic. ^ a b Mason, Stewart. "Bobb Trimble". AllMusic. ^ a b c d DeVille, Chris (July 7, 2017). "For Emma, Forever Ago Turns 10". Stereogum. Retrieved July 9, 2017. ^ a b c d e f Browne, David (March 8, 2013). "Freak Folk Courts the Plain Folk: Devendra Banhart's 'Mala' and Changes in Freak Folk". The New York Times. Retrieved July 9, 2017. ^ Jarnow, Jesse. "Arborea – Artist Biography". AllMusic. All Media Network. Retrieved November 18, 2016. ^ a b c d Sodomsky, Sam (June 14, 2017). "A Brief History of Prog Folk". Pitchfork. Retrieved July 9, 2017. ^ McDonald, Steven. "Comus". AllMusic. ^ "The Tip-Off: Richard Dawson". Spotify Community. Retrieved December 23, 2017. ^ Bell, Max. "Moulettes – Preternatural". Record Collector. Diamond Publishing. Archived from the original on June 4, 2016. Retrieved September 14, 2018. Auslander, Philip (2006). Performing Glam Rock: Gender and Theatricality in Popular Music. Ann Arbor: University of Michigan Press. ISBN 978-0-472-06868-5. Hermes, Will (June 18, 2006). "Summer of Love Redux". The New York Times. Leech, Jeanette (2010). Seasons They Change: The Story of Acid and Psychedelic Folk. London: Jawbone Press. ISBN 978-1-906002-32-9. Macan, Edward (1997). Rocking the Classics: English Progressive Rock and the Counterculture. New York: Oxford University Press. ISBN 978-0-19-509888-4. Sweers, Britta (2005). Electric Folk: The Changing Face of English Traditional Music. New York: Oxford University Press. ISBN 978-0-19-515878-6. Unterberger, Richie (2002). Turn! Turn! Turn! : The '60s Folk-rock Revolution. San Francisco: Backbeat Books. ISBN 978-0-87930-703-5. This page was last edited on 2 April 2019, at 10:16 (UTC).